You are here: Home > The Three-Way Burger Competition or Coalition? Not all fast food restaurants are alike. Anyone who would say that a hamburger is a hamburger whether it’s at McDonald’s, Burger King or Wendy’s, is someone who’s not been doing his homework or in this case, eating those big “juicies” that much. Fast food restaurants have their own unique personalities that fit every type of customer, or at the least the type of mood they’re in, in various moments. 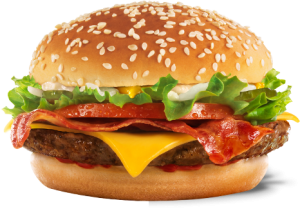 Of all the fast food burgers, the Whopper is the most traditional homemade charbroiled burger. Though there are a lot of veggies between the bread and patty, the only ones that stand out are the onions which are very dominant. Whopper is as good as the Whopper with Cheese because the chesses can do so very little compared to what their tasty juicy beef patty can deliver. The best cheese will be ignored and will be insignificant in an already perfect hamburger. Those who like to eat Burger King’s Whopper are people who love burger patties period. These are the all American folks who would like to have the feel of traditional barbecue gatherings at their house or friends’ houses. If you don’t have the time and energy to cook your own perfect burger patties on your grill, Burger King is the best alternative. Their Whoppers can make everyone feel at home. If you are looking for something traditional but with added juiciness and crunch then, you are looking for Wendy’s Big Bacon Classic. There are a lot of fast foods that also have the bacon burger variant but, they can’t compare to Wendy’s and, this is simply because they have allowed their burger to play its role a little bit toned down so that the bacon component of the sandwich can make its presence felt. Bacon is very tasty and juicy on its own but when in partnership with the burger patty, it doesn’t have a chance of being appreciated or even recognized. With the ordinary burger preparation, bacon will just be another meat extender. Wendy’s got their patty wrong as a stand-alone as in the case of their Big Classic variations. The beef patty is so weak that the veggies especially the onions are dominating the taste. The Big Classics are sort of a deli version of a hamburger. In combination with bacon as in their Big Bacon Cheeseburger, their burger patty gave the bacon its proper part of the stage to shine. The beef and bacon in Wendy’s Big Bacon Burger is the only way beef and bacon can come together in synergy where one plus one equals three, Burger + Bacon = Perfect. McDonald’s Big Mac is the most untraditional of the fast food burgers. Though there’s that beef taste in their patty, it’s pretty much the sauce and the cheese that’s giving it its personality. Big Mac is as commercial as it gets but, people are loving it. More people eat Big Mac than any other hamburger maybe because it’s not a cheeseburger, it’s a Big Mac. Since the concept of fast foods is new then, it’s best represented by another creation, a burger that’s not really a burger but a fast food burger, a Big Mac. The good thing about these three burger fast food giants is that they are doing business with the same kind of people who patronize all three in a cycle. Aside from a few people who have pledged allegiance to one of the three, most people will be loving one for a while then another and then, the other. Whopper lovers will remain faithful of a while. Then, no matter how much they say that the Whopper is perfect, they will get tired of it and move on to loving either the Big Mac or Big Bacon Burger Classic. Each fast food burger chain will get that person’s business from one burger lovin’ season to another burger lovin’ season. However these people who are trying to be faithful are only a minority, most go wherever they want depending on their mood. On the days when a person likes to have a hamburger, he’ll go to Burger King and have a Whopper. If the same guy wants hamburger with bacon, he’ll go to Wendy’s for a Big Classic Bacon Burger. And, if he can’t decide, he’ll go to McDonald’s for a Big Mac. So, is there still competition between the three giants? In a sense no, but they have to force themselves into one because if all is quiet, they’ll lose out on the publicity. Well, not exactly publicity because all three are already household names in the fast food industry. It’s more of just being on the air and being talked about. With all the things going on and the new things that are entering the highways of interest, these three giants still need some controversies, just to say that they are very much alive and struggling, so to speak.